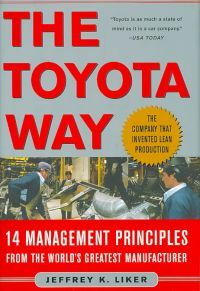 The Toyota Way is a very interesting book. It has become a classic in the description of the success of Toyota. Toyota have through a focused and resilient work become the largest car manufacturer in the world. That is amazing, as they started out during a tough time after the second world war, and later on had a reputation of generally bad quality, together with other things coming from Japan. That was however not really true. One of the most important parts of the success is the culture within the organization. The book explains the 14 management disciplines that I find very interesting. They all breath another way of thinking and therefore success. Many organizations that work according to LEAN does not live up to the 14 management principles. They merely use LEAN as a tool in some of their business, but they do not see and/or understand the power of the philosophy. The first discipline is that you should work in a long time perspective, even if it cost you short term profit. A lot of organizations find i more important to live up to a balanced budget and/or give the stock market good news about the profit in the company. My tips is to read the book with paper and pen at your side, and then take notes of how you and your business could use the principles. To build a culture of continuous improvement does take some time and a lot of enthusiasm, discipline and long term vision. The book is divided into three parts. Part one gives a background to the success. Part two explains each and every one of the 14 disciplines. Part three focus on the work to be done in order to work according to The Toyota Way. The book is well worth the time you spend on reading it. Good Luck! Previous Post Business Excellence Revolution Next Post Do not talk about yourself in a way that you do not wish to be true!